Elmira b. 1/19/1810 Rochester, Plymouth MA, d. 9/7/1888 Marion, Plymouth MA. Priscilla b. July 1849 Rochester Plymouth co. MA, d. April 1937 Marion, Plymouth co. MA. Royal and Priscilla lived in Marion and are buried there. They had 5 children, including: Myra, Alice A b. 1/17/1871, Delano b. 1/19/1873 and Clifton b 11/23/1874. Their son Delano R. adopted a son. 4) Mary E. b. 12/17/1843 New York d. 11/1/1899 Allendale, Bergen NJ. buried Rochester Center Cemetery, MA. 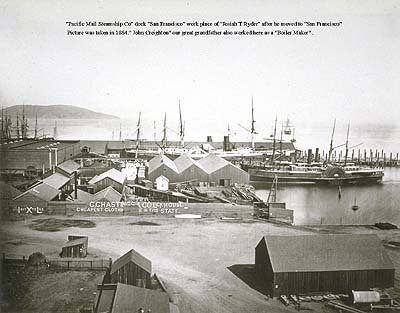 Josiah T. Ryder sailed to San Francisco, California on the ship Daniel Webster. He left New York on 3 Feb 1849 and arrived in the bay of S.F. on 21 July 1849. He never returned to NY or MA. 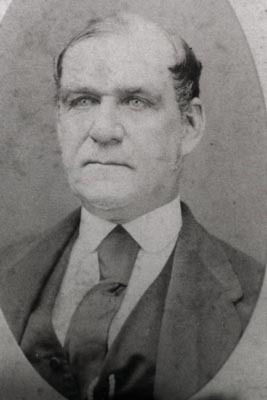 Nelle divorced James to marry H. Arthur Dunn, widower of James' sister Estelle. Shown here at Tiburon beach July 1918 with Carol Creighton, Helen Glass, Estelle Creighton, Lucy Glass, Ethel Hind, and Dorothy Hind. 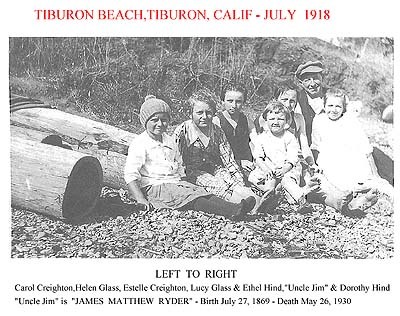 "Estelle Mary Creighton" was the third born child of "Edward" & "Loretta",she was born on Sept 30, 1910 in Marin Co,Calif and died of "Polio" on November 5, 1930 in "San Francisco". At the time of her death she was not married and had no children. "Caroline Crossland Creighton" (Carol) was the fifth born child of "Edward" & "Loretta". "Carol" was born in "San Rafael", Calif, on March 28, 1914. On November 4,1940 "Carol" married "John (Jack) Ericson" at the "Carmel Mission", they had one child a daughter named "Robin Delano Ericson". "Carol" passed away June 4, 1996. "Glass" and "Hind" families were probably neighbors of the Creightons. Thomas Burns(Byrnes) parents John? Burns(Bynes) and Ann McVoy?